Trad. The sheet music is included. This song has been around since the 1940s Its origins are American but is more popular in Ireland thanks to Johnny McEvoy who made it famous in Ireland in the 1960s, Also recorded by the late Dermot O'Reilly. 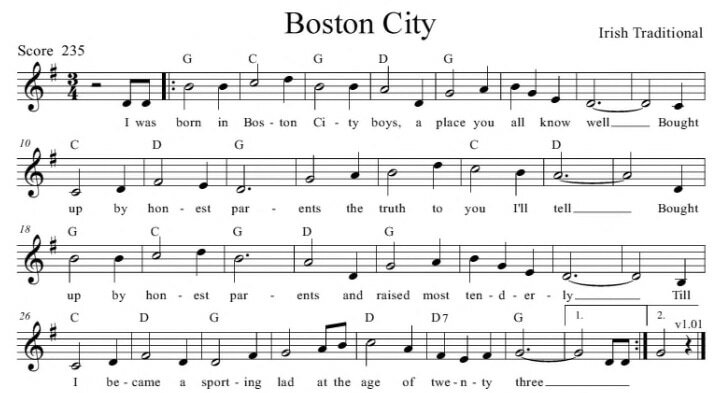 It's also called ''Boston City''. The judge he passed the sentence,I was bound for Charlestown. For one crime or anothr he is bound for Charlestown. ​Alternative guitar chords for the key of G Major. Here's the sheet music for The Boston Burglar in the key of G Major.